March is National Problem Gambling Awareness Month (NPGAM). The goal is to raise awareness about problem gambling. This campaign seeks to educate the public and healthcare professionals about the warning signs of problem gambling and promote the availability of help and hope both locally and nationally. The Kentucky Council on Problem Gambling (KYCPG) adopts the National Council on Problem Gambling (NCPG) effort to encourage everyone to Have the Conversation about Problem Gambling. Most adults gamble or know someone who gambles, and therefore could benefit from programs to prevent gambling addiction. We believe many who suffer in silence do so because they don’t know why they developed a problem, what gambling addiction is, or where to get help. Use the resources available at the link below to plan activities to help individuals learn the signs of problem gambling and know that help is available. Kentuckyʼs Responsible Gambling Education Week (RGEW) takes place the first full week of August each year. The purpose is to raise awareness of responsible gambling behavior in an effort to lessen the amount or the impact of uncontrolled gambling behavior. About 95 percent of the population gambles for entertainment or recreation with no adverse consequences. However, studies show about one percent of the population is addicted to gambling behavior, and about three percent has a problem with gambling. Problem and addicted gambling — continuing to gamble in the face of negative consequences — can be devastating not only to the individual gambling but also to his or her family, friends, co-workers, and employers. Kentuckyʼs RGEW is planned by a coalition chaired by a representative of the gambling community — lottery, horse racing, charitable gaming, and casinos — and consisting of representatives from the gambling industry, Kentuckyʼs certified gambler counselors, academics, and the Kentucky Council on Problem Gambling (KYCPG). Since its beginning in 2002, RGEW has been a source of posters and rack cards distributed statewide to raise public awareness about problem and addicted gambling. Additional RGEW activities are media advisories and appearances, video production, and counselor training programs. The RGEW coalition created a simple website to advise individuals of problem and addicted gambling and provide referrals to counselors or Gamblers Anonymous: www.kygamblinghelp.org. KYCPG’s mission speaks to the organization’s belief in awareness and prevention. KYCPG will increase awareness of problem gambling, promote prevention and research, and advocate for the availability of treatment. KYCPG believes it is more effective long term to prevent problem and addicted gambling behavior than to either treat it or experience the negative impacts of problem and addicted gambling: domestic abuse, criminal activity, bankruptcy, loss of work, suicide, and more. Responsible Gaming Education Week (RGEW) held annually the first week of August. National Problem Gambling Awareness Month (NPGAM) held annually in March. Choices, an adaptable curriculum for adolescent addiction awareness. 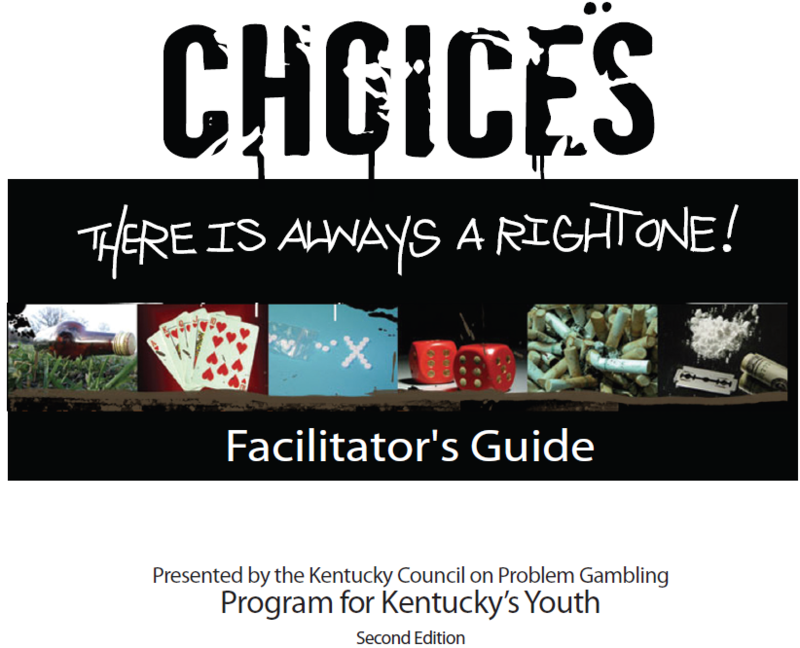 Choices, produced in cooperation with the Kentucky Lottery Corp., offers peer-to-peer vignettes of different addictive behaviors, including gambling. Several posters, brochures and rack cards to raise awareness of problem and addicted gambling behavior. WHETHER you should gamble, knowing that losing is likely, that you cannot control chance, and that it doesnʼt interfere with other responsibilities? WHEN is it appropriate to gamble, understanding that gambling is not a healthful way to deal with emotions or stress? HOW MUCH money and time can you gamble, recognizing gambling is entertainment and not an essential expenditure of time or money? Keep track of preset time and money limits. Avoid the ATM or other sources of money or credit. KYCPG can arrange for presentations by certified gambler counselors, clergy with training on problem and addictive gambling behaviors, or KYCPG staff to raise awareness of problem and addicted gambling. For more information, please contact KYCPG Executive Director Michael R. Stone (kmstone1951@gmail.com, 502-223-1823). KYCPG will continue efforts to raise awareness about problem and addicted gambling and develop programs in an effort to minimize problem and addicted gambling behavior. As new programs are debuted, they will be available on this website. Some states, provinces and academic institutions have developed gambling prevention programs. Choices — There ALWAYS Is a Right One! is a complete lesson plan to raise awareness of potentially addictive behavior and consequences. It targets middle school and early high school youth. Produced in cooperation with the Kentucky Lottery Corporation, it covers all addictions, but does have a gambling component. The package comes complete with a peer-to-peer video of five addiction scenarios, lesson plan, and discussion questions. For ordering information, please contact KYCPG Executive Director Michael R. Stone (502-223-1823, kmstone1951@gmail.com).